Created by Handytech, the Going is a convergence of innovation, experience, and 20 years of hard work. The Going Seated Segway is a revolutionary combination of the Segway's self-balancing technology and sophisticated mechanical controls. The Going aims to grant you the freedom to travel anywhere, day or night, on all types of terrain. The Going is so simple to use that you will be able to fully enjoy your surroundings without having to constantly pay attention to driving. Armed with a special safety system, Going also ensures maximum protection during driving and transfers. With the Going you can move around with ease by simply leaning forward and backward, with your hands free to steer the vehicle or do other things. The Going's "GO" seat module is one of it's most impressive features, it is easy to use both when driving and during transfers. The seat is made of high quality components and materials that have been specifically treated to minimize friction. The Going seat module adjustments were developed with the help of well-known physiotherapists to ensure that your posture is exactly equivalent to that of your wheelchair. The seat is also equipped with an orthopedic backrest installed on an adjustable reclining support. It features a waterproof cushion as well as a safe, adjustable footrest. 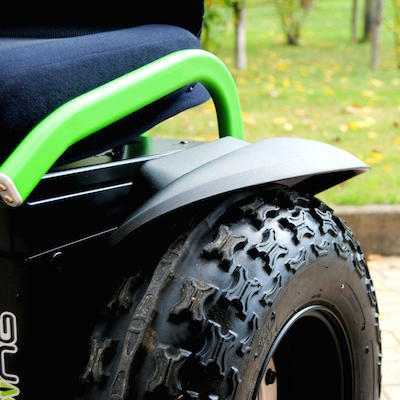 *You can choose from black, white, orange, green and blue on the Going's Tubing (including backrest bar and handle). The handles are the functional heart of Going and act simultaneously on Segway's security systems and the GO seat module, activating the "man on board" mechanical sensor and the electronic occupancy sensors, which lock the quick release handlebar. The Going is the perfect combination of advanced electronic technology and the most innovative mechanical engineering available. Locking/quick-release steering handle/ hands-free balance activation control system. Four InfoKey Controller buttons, electronic functions can be activated and checked in real time on the integrated display. - Removable handlebar, easy to insert and equipped with safety lock when the vehicle is moving. Left or right landing gear trigger configuration and hide-away landing gear arms. The stabilizers operating handles are provided with integrated release levers. Stabilizers feature three main positions: on the ground for the transfer function; intermediate for fall prevention; raised up for moving and for the complete activation of Going. ADI carbon fiber backrest with pivoting mount. Carbon orthopedic backrest, adjustable and foldable. Seat adjustable in height, adjustable front and rear tilting as well as forward movement, equipped with a "man on board" sensor. - Restraining footrest adjustable in height. - Front and rear LED lighting to increase visibility during night-time use (autonomy of 48 hours). - Socket for plug-in charger for the lighting system power supply. Smartphone adapters can also be connected. 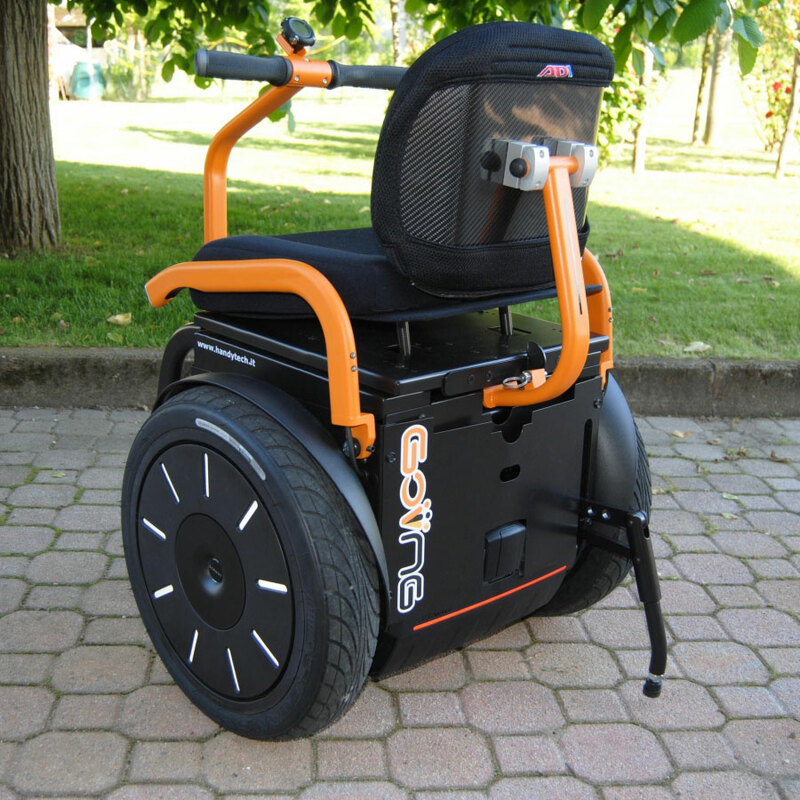 - The compactness and lightness of the GO module with folded backrest contribute to a light and compact vehicle, essential for easy transport. Hello and welcome to livingspinal.com. I'm Andrew and I'm going to be walking you through some of the seated segways that are available in the market. The unit that we are going to talk about is the ‘Going’. 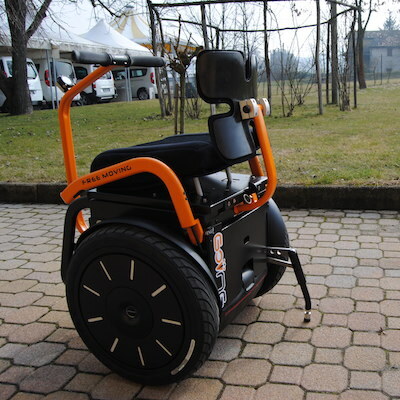 The Going is made by HandyTech and it is manufactured in Italy. Here is the product page. So, for latest pricing you want to go to livingspinal.com. In case any pricing has changed but, at this time it is $14,998 and that is with the original pre-set of options that are chosen. So, depending on your options it will change the price. This price is including a Segway and the Going kit. So it's something to be very aware of that in these seated Segway industry, we're talking about a Segway which is the power drive wheels underneath and a kit that goes on top. Let's go ahead and just look at our option sets. To get started we have colors. So we can go to this Going plus colors and then we have got red and blue which is what you see right there in the picture and then they've got carbon fiber. Let's go ahead find the carbon fiber on. So that's our carbon fiber which is kind of a gray almost black bottom base where these panels are carbon fiber all the way around printouts really cool looking. And you can get the backrest in a carbon fiber backrest which the black tubing carbon fiber it's probably one of our most popular designs. Lot of people they don't necessarily want the chair to be super flashy so that people are looking at them and not the chair. And then we have got flowers as another design that you can choose and the last one is denim jeans. There are cool characters within the denim jeans and then the fabric there is a seat cushion with more of a denim feel to it. So I am going to go ahead and click out of there and we are going to go back to the tubing package, so that would be the metal tubing that are the armrest, the backrest post the steering arm post, that all of those metal tubing pieces or your tubing package and you have got white, orange, blue, and green. And then we will go ahead and scroll down and we have got our backrest and that comes in ADI medium back rests and ADI large backrest and ADI quad backrest. What that means is, for the quadriplegics in the market, me myself I'm actually a quadriplegic and everybody is different you know every level of injury, every different disorder or whatever ails you, that's how we call it as living spinal. So many different ways the spinal cord might ail people and so if you have a bad balance and your core is a little bit weak, you may be very interested in a quad backrest because, it will have some lateral support built right into the backrest. 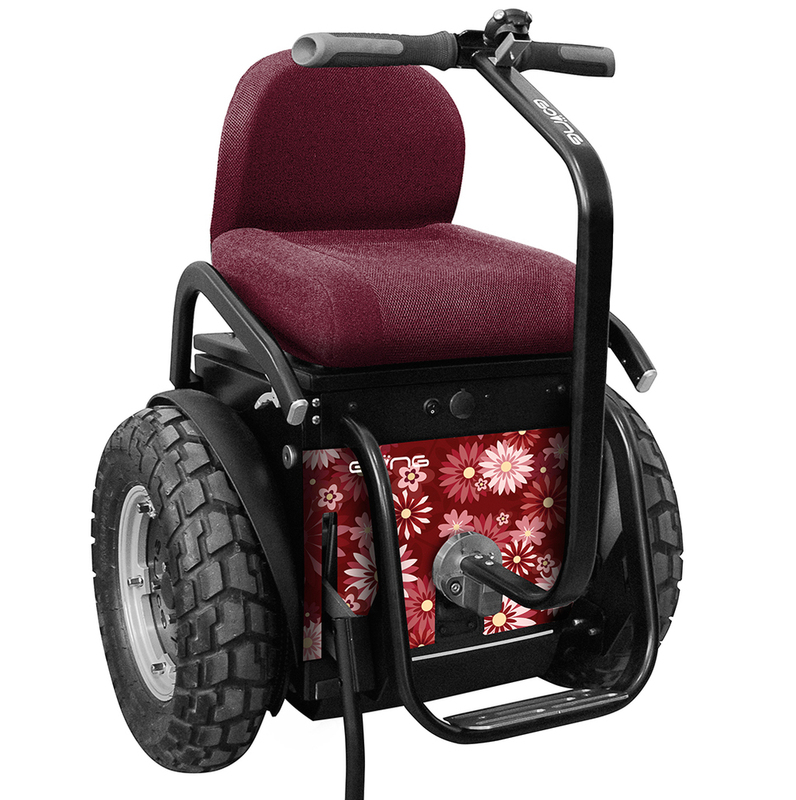 So the sides of the backrest will have a little bit of support there, which is a really great thing to have and then it also has a quad backrest multicolor. So we've covered backrest next thing we've got here is landing gear. This is a really unique feature of the Going by handytech is that you can choose whether you want the landing gear lever arm to be on the left or the right side of the unit. A stroke can be very one sided same thing with spinal cord injuries. Sometimes they can be incredibly one sided where someone's grip in their hand is really weak on one side and so if that is your situation with the Going, you can actually choose which side you actuate the landing gear with. Which is going to be incredibly important that's how you're going to get on and off the unit. On each side there are a armrest that you could hold on to more place for you to hold with your hand, that doubles as the actuator for the landing gear and when I say landing gear I'm talking about this leg in the back here and then there's another one in the front, so if we go to one of these pictures of the front view. You'll see that there's another leg here that goes down. When you squeeze this handle right here you will pull upon the arm and it will deploy the landing gear, which will steady the unit and allow it, so that it cannot tip over and you can shut the unit off and then you can safely get on or get off of the unit. Another feature that really specific to the Going and I don't think there's even any other units in the industry that do this steering arm in front here. It actually is removable a lot of the units have your removable ends but with the Going when you go and sit on the unit and you have the steering arm there it locks the unit. Once you bring the landing gear up and you are sitting on the unit the steering arm is locked and that is a huge thing because how much of a bummer is it going to be if you're cruising along and you go in lift up on the steering arm and it comes out of the socket which is mounted down below and would be a little bit difficult to get back in while you're riding could be dangerous with this on it's got a built in safety feature so that if you're riding it's locked in general the Going is one of the nicest segues in the industry for its design and the quality of its construction. The company handytech that manufactures it. Also manufactures lifts for cars in Italy. So they definitely have the machinery and know how to do quality construction of metal machinery. The next thing that we're going to talk about and this is also a very unique feature is that in the front here there's a twelve volt charging station, all of your cell phones can get charged while you're riding. You could set up GPS and it can be powered through the unit. The next thing and this is crazy. So they have decided that go ahead and send me a picture of anything. So let's say that I just love Hello Kitty. I pick out a beautiful high resolution picture of Hello Kitty and we can send it with the order and these panels for the under piece are actually going to get custom made into a pattern of Hello Kitty. So if something you just love, you love sailing, you love motocross, you love Hello Kitty, you can get that on your Going which is really unique. 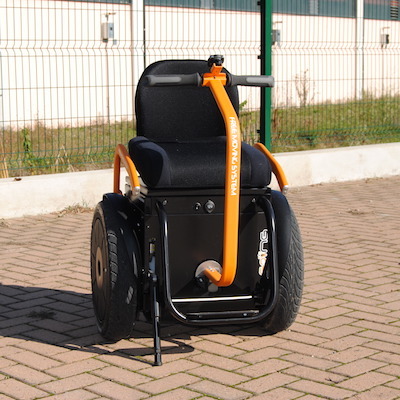 The backrest is folding and has a locking pin for the folding mechanism the unit together can also go on the X2 Segway or the I2 segway. So you may ask me, you know what's the difference between an I2 segway and an X2 segway. Well the I2 has more of a street tire on it, similar to what you see here in the picture and it sits about 25 inches wide all together. Whereas the X2 tires are more of a low pressure, off road kind of dune buggy tires, which makes the overall with 33 inches. 33 inches can be difficult for indoor use in getting in and out of doorways. Most doorways are 25, 28, 32 inches, your big commercial doors would be 36 and you could get through those. From the beginning you know I've got a lot of hours and a lot of time on seated segways and I've always been shocked at how much even the I2 tires can do the more street tires. If you just want to go on trails, grass paths, dirt gravel, anything like that is absolutely no problem for I2 tires, where your X2 tires are really going to dominate and be kind of mandatory is thick lofty sand. So if your desires to go on the beach again you'll want an X2, if your desire is to go and do pretty extreme off roading or get into loose materials in the woods or maybe wet materials, riverbeds or different things like that, you're going to X2 and that's going to be such an incredible vehicle for you. The handlebars I need to say, they actually have LED lights built into it. So the unit has a switch on it and it has headlights to keep you illuminated at night. Which is really nice you know, because you'll be cruising along and you don't see a curb or something like that you don't want to be just running the stuffs that night. So being able to put a light under the situation is quite nice. I think that's just about everything that I can think of on the Going by handytech, only available as livingspinal.com. Well that will do folks, thanks so much for being a part of this video and you have a great day!! Life has gotten much more adventurous since I got my Going! I'm loving the freedom and easy mobility I now have. The landing gear is critical. I have better grip in my right hand so I'm using the right hand landing gear lever. Couldn't be happier! !